Citroen has revamped the diesel line-up of its C8 people carrier with the introduction of two new economical and Euro IV compliant diesel engines. 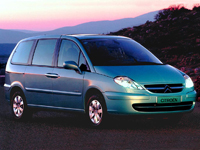 With over 80% of all C8s currently sold in the UK equipped with diesel powerplants, these new models are set to further increase the desirability of this popular and versatile large MPV. Combining frugal fuel economy with sub-190g/km CO2 emissions, these great value models come with six-speed manual gearboxes for a relaxed and refined driving experience, and will prove popular with both private buyers and company car owners, who will appreciate the lower taxation. Environmentally-conscious owners will be especially pleased to note that both versions can also run on up to 30% bio-diesel. The range-topping 136hp 2.0HDi 16V unit returns 40mpg on the combined cycle, CO2 emissions of 188g/km and is fitted with a Diesel Particulate Filter System that reduces particle emissions to virtually immeasurable levels. With a maximum speed of 118mph and up to 236 lb.ft of torque on tap, the new engine replaces the 130hp 2.2HDi unit. Drivers of 120hp 2.0HDi 16V models will be able to stretch a gallon of fuel even further – 41mpg on the combined cycle – with CO2 emissions of just 182 g/km. This new derivative is capable of up to 112mph and can deliver 221 lb.ft of torque at just 2,000rpm. The current 110hp 2.0HDi 16V version will continue as an automatic only. Stylish, spacious and extremely versatile, the C8 people carrier can seat up to eight passengers in comfort thanks to three flexible rows of seating – with the second and third row of seats removed, it offers a cavernous 3,000 litres of load space. Highly specified, most models come with remote control operated sliding side doors, automatic digital tri-zone air conditioning, an alarm and automatic wipers and headlamps as standard. The first large MPV to receive a 5 star Euro NCAP rating for occupant protection, the C8’s long list of safety equipment includes six airbags, ABS with EBD and EBA, and ESP with traction control. Prices for the new diesel models start at £18,000 for the 120hp 2.0HDi 16V LX and £20,025 for the 136hp 2.0HDi 16V SX, including the August offer of £3,000 cashback. Most models also currently attract a choice of either 0% or low-cost finance.